Why is Holllywood output so gratuitous and male gazey? A question that writer and feminist Diane Nguyen tackles in season five of a show that always has its finger on the pulse when it comes to the film and entertainment industry. It's another biting and hilarious season that's unafraid to call out what's wrong while also offering up relatable characters who go through their own personal crises. Its targets, though not named, are obvious, with one character, Vance Waggoner an amalgam of male actors who have committed heinous deeds only to be forgiven, awarded multiple second chances and flourish in their careers. 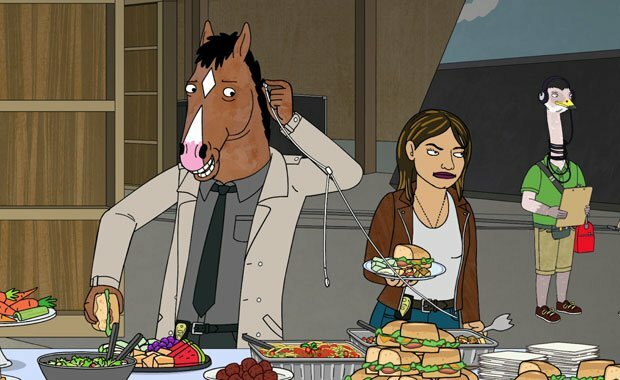 The special guests keep getting better with Stephanie Beatriz, Rami Malek, Issae Rae and Wanda Sykes all appearing and having brushes with the fragile ego of Bojack Horseman (Will Arnet) as he stars as a detective in a film noir television series created by a clueless and hugely sexist idiot who thinks he's a god. Princess Carolyn (Amy Sedaris) is busy trying to excel in her career while Todd (Aaron Paul) lands a priceless job and invents one of the best ongoing jokes of this series. The punchline is so viciously on the money in this absurd backlash climate where men feel they're making a stand by wearing 'Weinstein is Innocent' t-shirts on the red carpet of prestigious film festivals. There are of course the precious stand-out episodes that detour from the typical set-up. One takes place entirely from the pulpit of a funeral service, another renames and repurposes the characters with sharp-witted animated jokes and creativity. And there is always an episode that is so heart-breaking and profound it could be speaking to your own personal experience. Whether the show is dealing with adoption, identity, dating woes, divorce, addiction, career burnout or the endless toxic media cycle it does so with an insightful clarity that is both damning and compassionate. BoJack Horseman, Season 5, is available on Netflix from Fri 14 Sep.